As you can see in Figure 2 we have two approaches for our production system. In Figure 2A you can find our first approach where we also used the AdhE from E. coli. We disclaim the temperature system and put all coding sequences in a row behind a promoter separated by the RBS upstream of each gene. 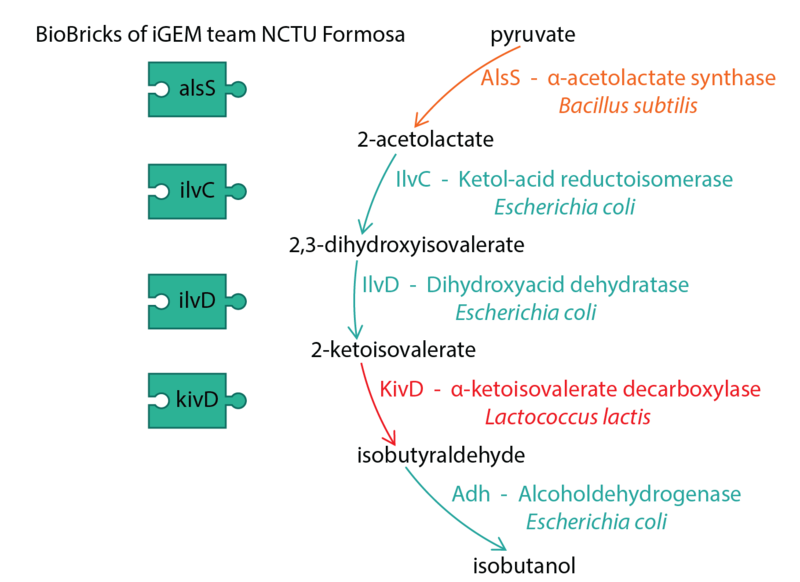 During our literature research about the isobutanol production pathway (Figure 1) we found out, that the alcohol dehydrogenase from Lactococcus lactis (AdhA) is more efficient than the one from Escherichia coli (Atsumi et al., 2010). We wanted to increase the production of isobutanol by cloning the adhA gene downstream of our producing pathway. You can find a schematic illustration of our created BioBrick BBa_K1465307 in Figure 2B. For characterization of the protein expression of BBa_K1465302 under the control of T7 promoter look at the BioBrick BBa_K1465302. To proof the isobutanol production of our cultures carrying BBa_ K1465306 and BBa_ K1465307 we performed two cultivations. First we made a calibration curve, so we can quantify the production. For this, we prepared samples with the concentrations 0.001%, 0.01%, 0.05%, 0.1% and 0.5% of isobutanol in LB medium. Like shown in Figure 3, the regression curve has the function 1.1058x + 0.0005= y and R2 is 0.999. With this, we made the upcoming quantifications. The normalized peak area is the peak area of isobutanol divided by the peak area of 2-butanol, which is the internal standard. For the evaluation of the GC-MS data we did not want to calculate with percent but with mg/L. Therefore, we converted the percent values by multiplication with 10 because the samples were diluted 1:10 before the measurement. Multiplication of the resulting value with the density of isobutanol, which is 802kg/m3 yields in g/l, which can be multiplied again with 1000 to get mg/l. We also made an evaporation experiment to check the recovery rate of isobutonal during our experiments. We performed this experiment at 37°C over 20 hours and found out that about 50% isobutanol disappeared. In this setup we compared flasks we opened ten times and flask we just opened in the end. The amount of the opened flasks was in the error margin of the not opened flask. Hence it can be said, that the isobutanol concentration is not influenced by opening the flasks. 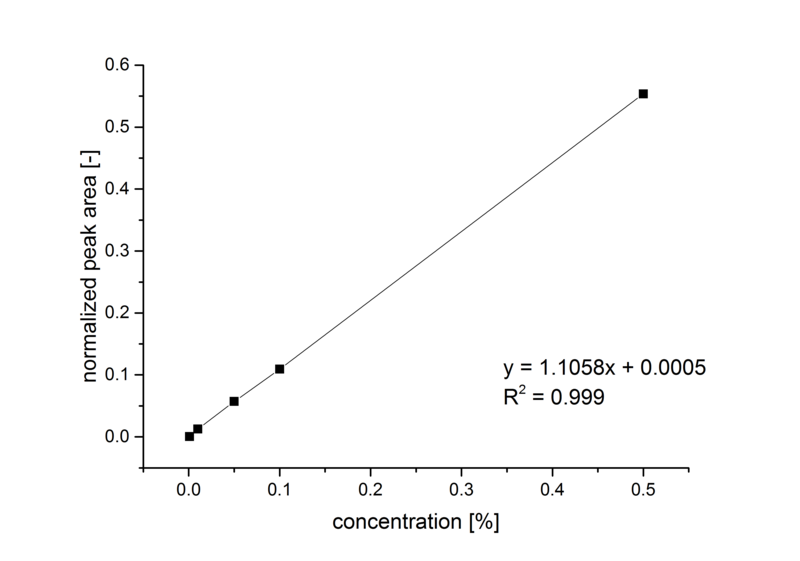 Figure 3: Calibration curve for the calculation of the isobutanol amount in the GC-MS data. The first cultivation for producing isobutanol was made at a temperature of 37°C. We induced our construct carrying cultures after 1.5 h at an OD600 of 0.8. As controls, we had the KRX wildtype and not induced cultures carrying BBa_K1465306 and BBa_K1465307. We also had controls, which just were analyzed in the point of induction and in the end. These were the induced BBa_K1465306 and BBa_K1465307 cultures, the not induced ones and the KRX wildtype. For the GC-MS analysis we took samples at the point of induction and then four, seven, ten and 20 hours afterwards. In Figure 4 you can see the comparison of the OD600 of the analyzed cultures. It is conspicuously, that the induced constructs are growing slower from the point of induction, which indicates that there might be an redirected flux towards the isobutanol synthesis. 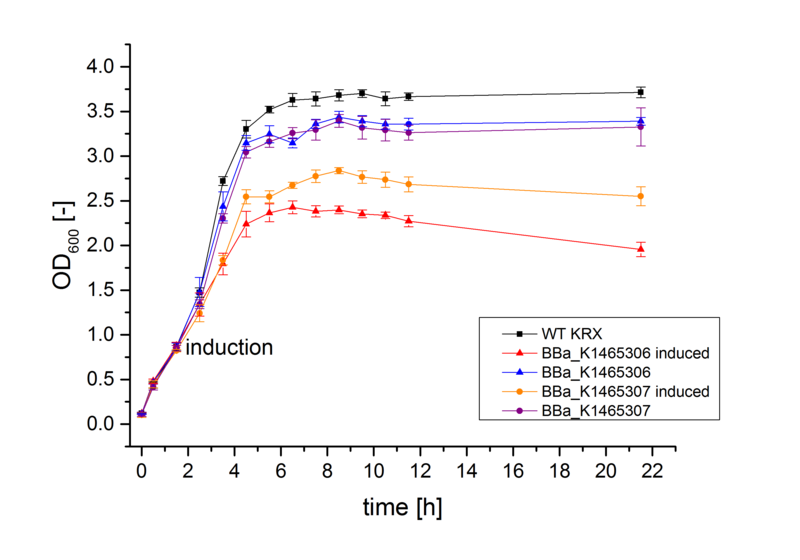 The growth of the not induced cultures carrying BBa_K1465306 and BBa_K1465307 were showing a slightly decreased growth than the wildtype, which might be because of the large plasmids. Figure 4: Comparison of the growth of the analyzed cultures at 37°C. Using GC-MS analysis we could prove the isobutanol production. The amount of production is shown in Figure 5. It is displayed that the isobutanol production increases over the cultivation time. In the stationary phase, the isobutanol amount decreases. Evaporation might be an explanation for this. 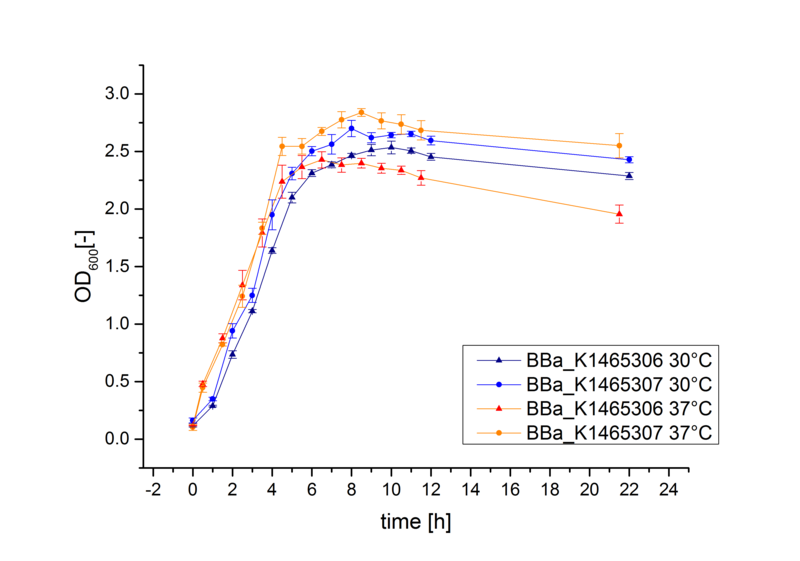 Differently than expected, the culture carrying BBa_K1465307, which includes the adhA produced less isobutanol than BBa_K1465306. The maximum amount of isobutanol produced by the strain carrying the BBa_K1465306, the BioBrick without the adhA is about 55mg/l and of BBa_K1465307 about 37 mg/l. We were able to show in a SDS Page that all proteins were expressed. Figure 5: Comparison of the growth and the isobutanol production for cultures at 37°C. The second cultivation was performed at a temperature of 30°C. At this temperature we expected a better protein expression, thus a better isobutanol production. In Figure 6 a comparison of the OD600 of the induced constructs at the different temperatures is shown. The growth at the different temperatures is nearly the same. During this cultivation, we took samples at more time points to get an indication for a product formation rate. We took samples in the point of induction and then after two, four, six, eight, ten and 20 hours. In Figure 7 the isobutanol production is shown in comparison to the OD600. Here you can see the expected trend, that the culture carrying BBa_K1465307, the one with adhA, produces more isobutanol than BBa_K1465306. Nevertheless, the amount is much lower than the amount of BBa_K1465306 at 37°C. 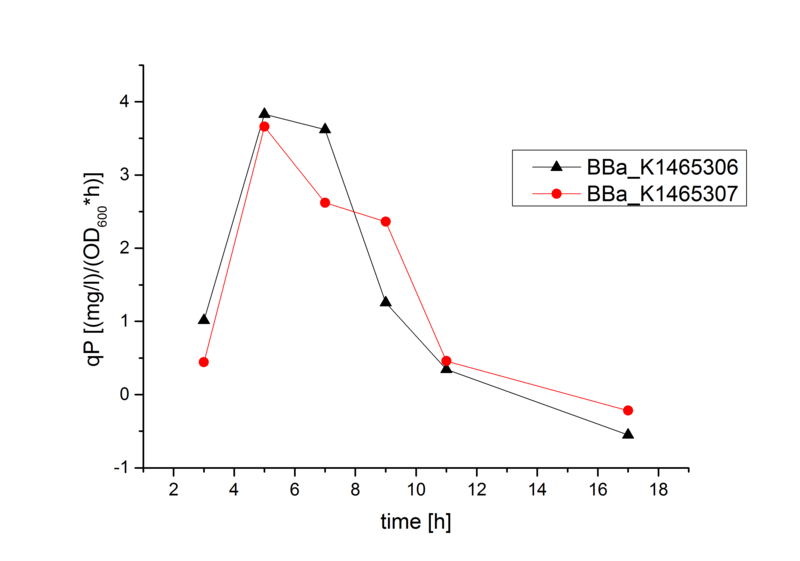 Figure 6:Comparison of the growth of the induced cultures carying BBa_K1465306 and BBa_K1465307 (with adhA) at the temperatures 30°C and 37°C. 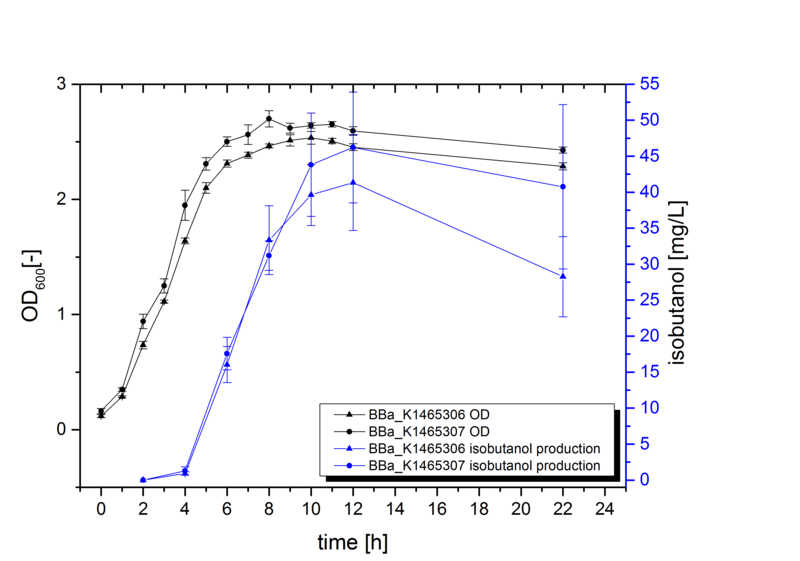 Figure 7: Comparison of the growth curves and the isobutanol production for cultures at 30°C. BBa_K1465306 is the construct without the adhA and BBa_K1465307 the construct with the adhA. The growth is shown in black and the isobutanol production in blue In Figure 8 the product formation rate is shown. It is obvious, that the product formation is not increasing directly from the point of induction. In the first two to three hours after induction there is no production of isobutanol, Three Hours after induction the amount of isobutanol increases until about six hours after induction, from then the production works well for about four hours. After this the amount decreases. 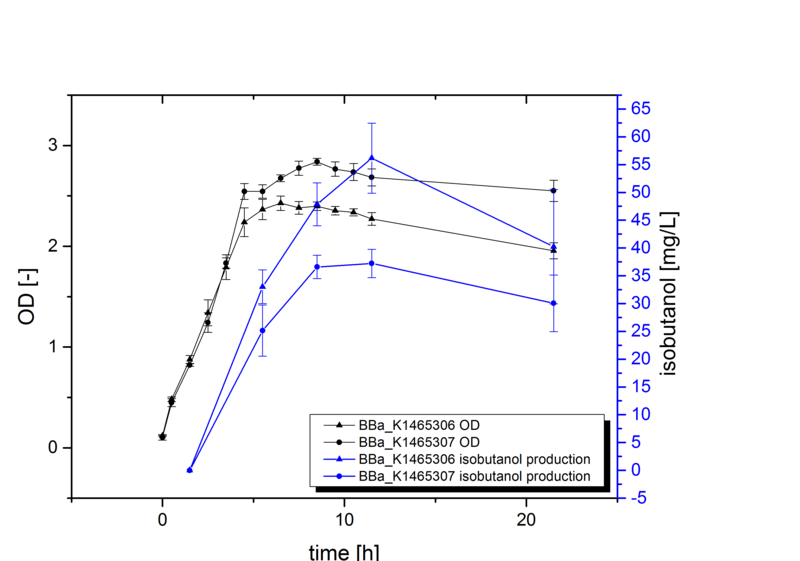 Figure 8: Product formation rate of the cultures with BBa_K1465306 (without AdhA) and BBa_K1465307 (with AdhA) during the 30°C cultivation. We successfully created six new BioBricks of which four are available in the parts registry: BBa_K1465302, BBa_K1465303, BBa_K1465306 and BBa_K1465307. The two other BioBricks are pSB1A2_T7_alsS_ilvC_ilvD_kivD and pSB1A2_T7_alsS_ilvC_ilvD_kivD_adhA. Further, it could be shown that isobutanol was produced. We could not show, that the production with AdhA taken from L. lactis is higher. The expression of the E. coli own adhE seems to be enough.